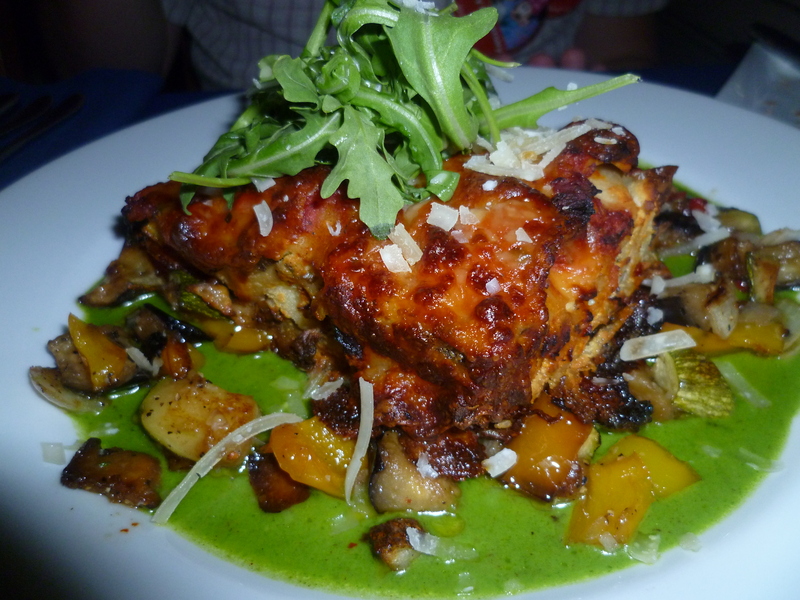 Here is another of the amazing restaurants we ate at while in Florida last year. Narcoosee’s is a Signature restaurant located at the Grand Floridian Resort and Spa hotel, near the Magic Kingdom. As I said before, we were on the Disney Dining Plan and used 2 credits each for this meal. It was so worth it! One of the best meals I’ve ever had, ever! Narcoosee’s is outside the main hotel, down by the lake. It is actually set over the water and offers stunning views across the Seven Seas Lagoon and over to the Magic Kingdom, perfect for watching the fireworks after dinner! 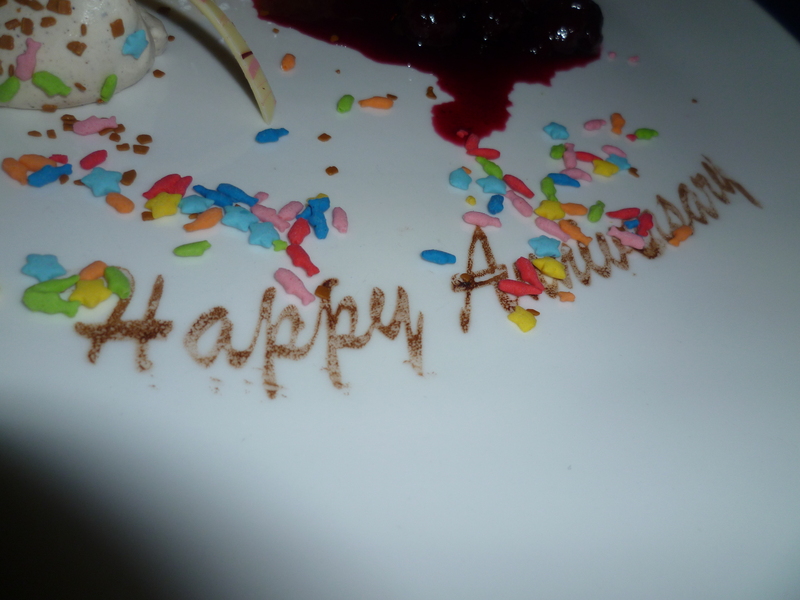 We had planned this as our Anniversary dinner as we had been together 7 years which is definitely cause for celebration – I added this to the online reservation I made 180 days before. Our ADR was for 7.10pm. We were greeted by a lovely Cast Member who wished us Happy Anniversary and said there was about a 10 minute wait and would we like to wait on the balcony? Ummmm yes please! So we went out the little side door out onto the balcony that goes all the way round the restaurant. Such amazing views! We had been out there about 5 minutes when we were told our table was ready. 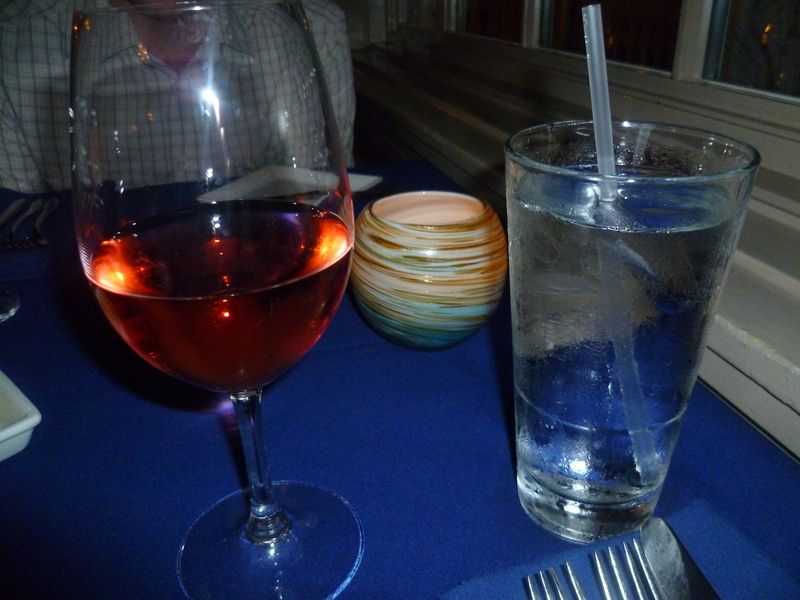 We were led inside to a PERFECT TABLE, right against the window, opposite the Magic Kingdom with a view of the castle. Little bit of pixie dust there I think! I was so pleased. 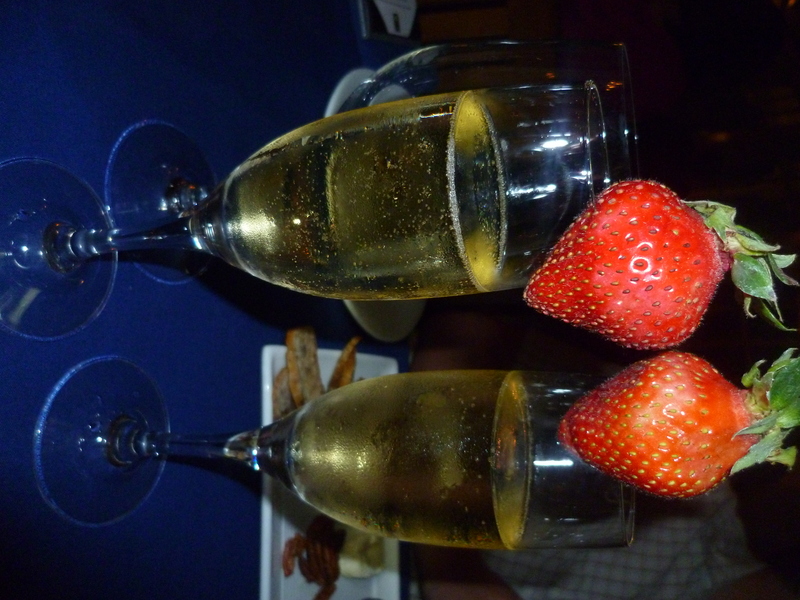 Our server was Amir and he was just perfect – kind, funny, attentive, knowledgeable…I sound like I’m describing a blind date but he was just lovely! He introduced himself, wished us Happy Anniversary and produced two Happy Anniversary badges from behind his back! Adorable! He then asked us what we would like to drink and produced the menus for us to have a look at. But, not just any menus. 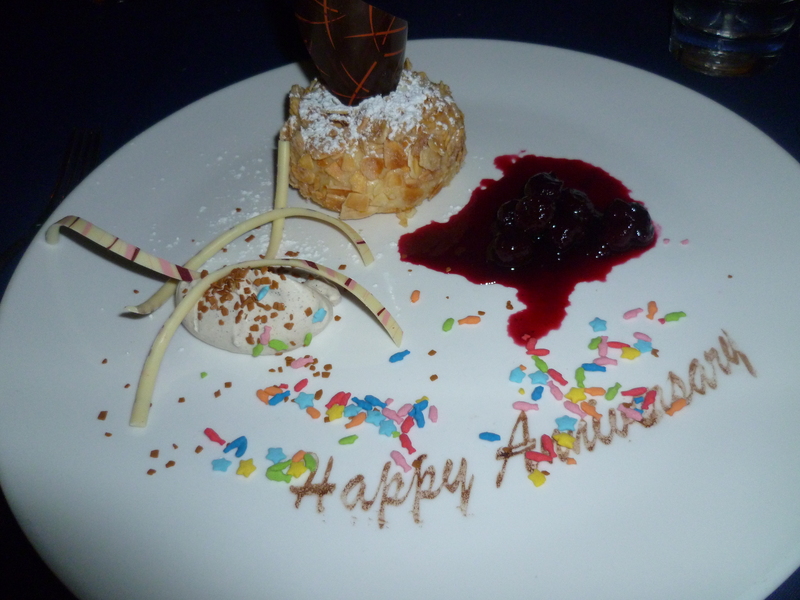 personalized “Happy Anniversary” menus with Minnie and Mickey on! I was so excited, we both thought this was such a cute touch and it really made our night. 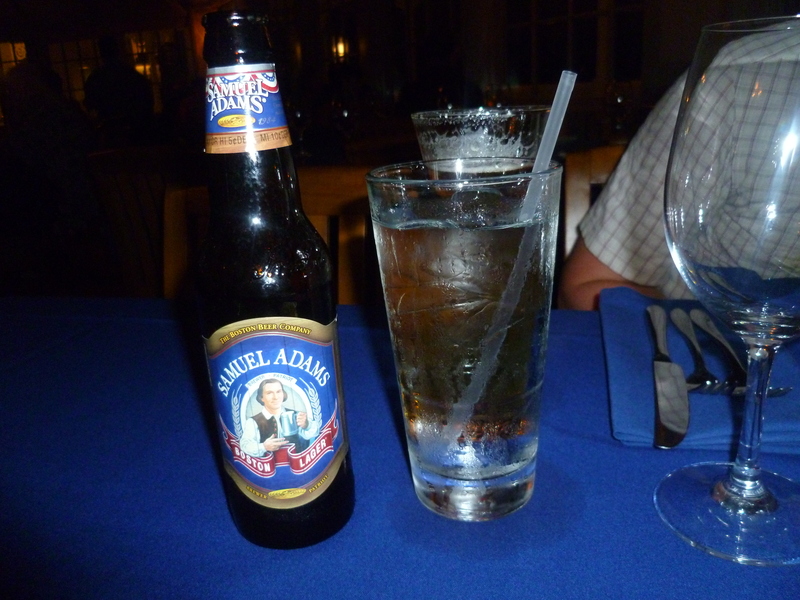 I just ordered a glass of rose and Benji ordered a Sam Adams. Apologies for the poor photos, it was very dark in the restaurant. Amir then bought us out some delicious warm sourdough bread, with butter topped with sea salt. Yum! I’m a total salt fiend and had to refrain myself from scraping it all off the top and dumping it on my bread so that Ben could actually try some. Every time Amir came over to check if we were okay we ended up deep in conversation as he was just a really chatty and interesting guy, we learned he had worked at Narcoosee’s for 12 years and absolutely loved it, you could tell he loved his job and was very proud of the restaurant. This made me really happy because Narcoosee’s gets very mixed reviews with lots of people saying it is their least favourite signature but right from the moment we stepped in I could tell we were going to love it. We were REALLY GOOD here and decided not to order starters. Shocker! There wasn’t anything on the starters list I was dying to try and I really really wanted to be able to finish what I was anticipating would be an amazing main course. Once we’d munched our way through most of the bread and had a good long look at the menu, Amir came over to take our order. I was of course torn between various items and needed help! From the moment I saw the Narcoosee’s menu (like a year ago…) I knew I was going to order the famous Surf and Turf. 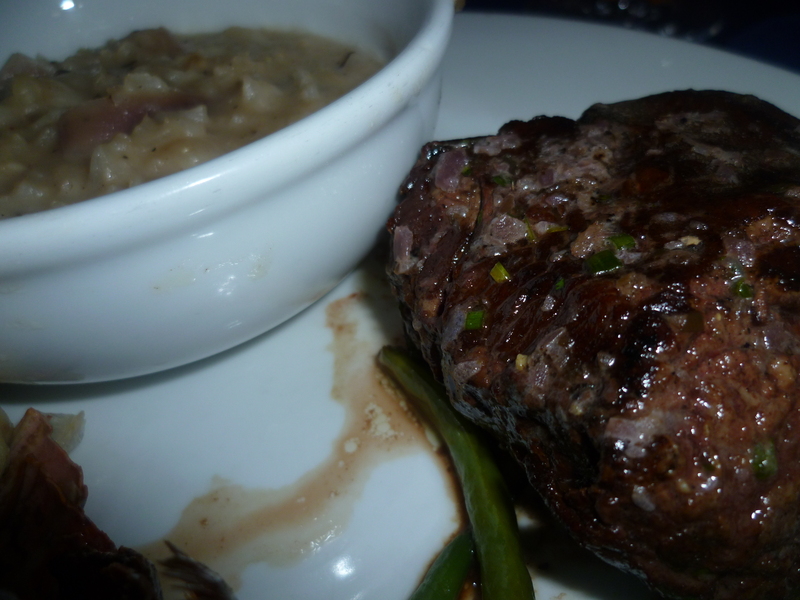 But, the dish was now being served with mashed potatoes (the menu changes seasonally) which I’m not the biggest fan of, and I was also tempted to order the Filet Mignon as that came with a delicious sounding risotto. As I was uming and ahing about which to order, Amir said ‘Well why don’t we just get you the Surf and Turf with a side of risotto?” Yes please! I was a very very happy girl. I ordered the steak medium rare. Benji was a lot easier to please as there was only one veggie option bless him. He opted for the Fall Vegetable Lasagna. Orders placed, we sat back with our drinks and waited, taking in the lovely calm atmosphere and looking out toward the castle. Not long after, our main courses were delivered to our table and we just sat there in stunned silence staring at them. They looked incredible! This was my dinner. 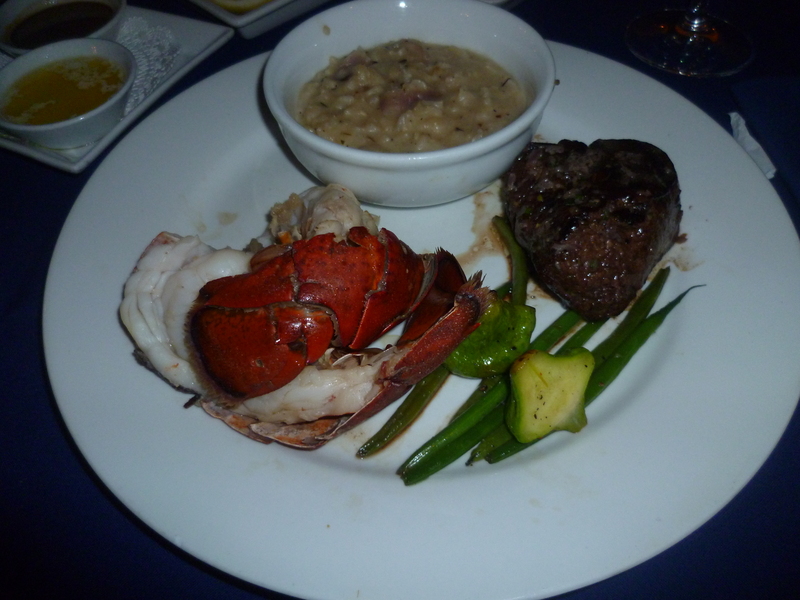 I ordered the Butter-poached Lobster Tail and Grilled Filet Mignon with Boniato Mashed Potatoes, Fall Vegetables, and Shallot-Red Wine Butter Emulsion, but substituted the mashed potatoes for the Gruyère Cheese and Caramelized Red Onion Risotto from the Filet Mignon dish. I got the shallot-red wine reduction too which was a bit of a bonus! I took one taste of the reduction and poured it half over the risotto and half on the steak as it was just the most rich, amazing flavour – it needed to be enjoyed with all areas of the plate. 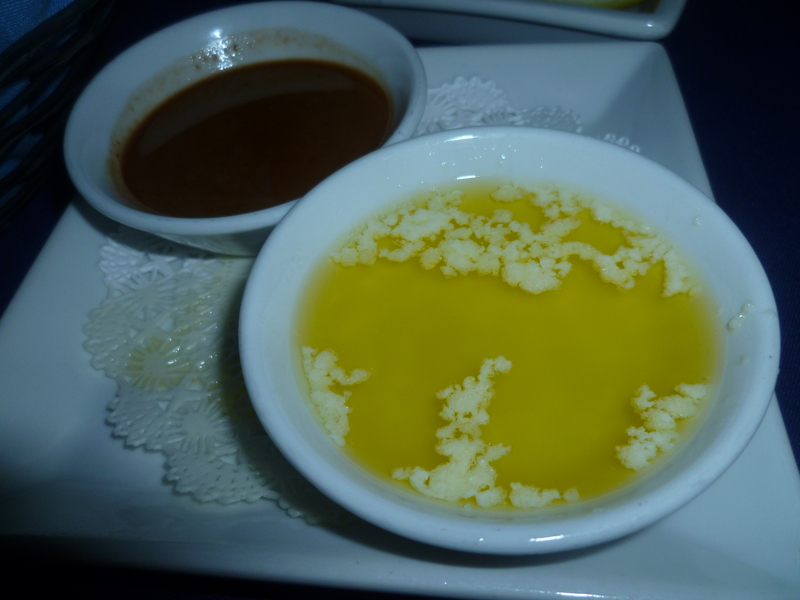 I reserved the butter emulsion for the lobster and dipped each piece in…then pretty much poured the rest on the last mouthful. I promise you, not a drop of either was left in the pots. Very classy. This was the first time I’d ever had real, properly cooked lobster and it is without a doubt the best thing I’ve ever eaten. The filet was fabulous of course, but the lobster was just in a different league. 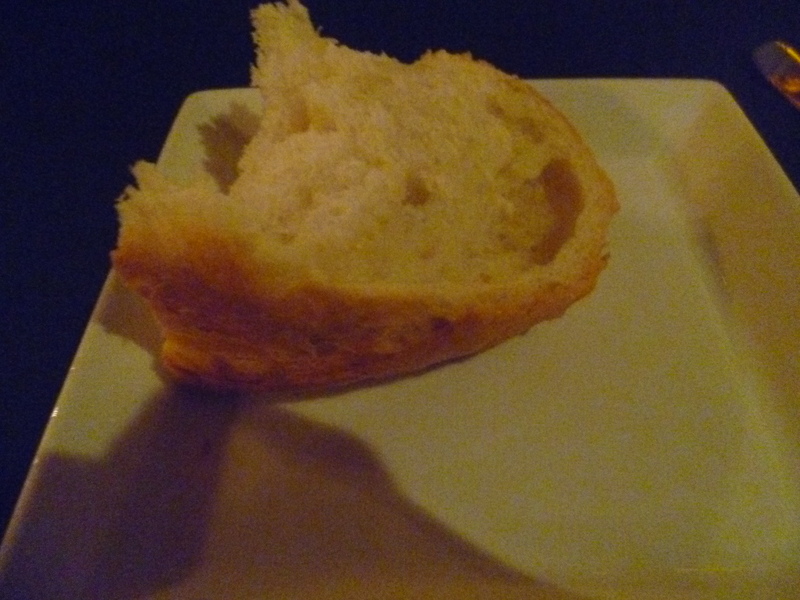 It was buttery, sweet and tender and I savoured every mouthful. The veggies were lovely too, perfectly cooked and a nice accompaniment to the rich meat and sauce. Phew! Can you tell I liked this dish!? Ben had a perfectly cooked lasagna, a huge portion, stuffed with roasted vegetables like courgette, pepper, onions, butternut squash and spinach. It was all bound together in a flavourful tomato/cheese sauce and topped with extra cheese that was mega crispy! It was sat in a crazily vibrant bright green sauce that turned out to be pea sauce. Just incredible. He ate every single last bite of his as well. Amir came over half way through to ask how we were doing and we asked him loads about the food and I was gushing quite a lot about it all as I tend to do and he seemed really pleased. All too soon I realized my plate was empty! Nightmare! Luckily I still had a tiny bit of room for dessert, PHEW! Just a tiny bit though. I had to order the Almond Crusted Cheesecake. Had to! Look how beautifully it was presented to me. It came with a lambert cherry sauce and it was absolutely to die for. I was so full I thought I might keel over but I managed to force down most of it. The almond crusting gave an amazing crunch to the cheesecake, perfectly complimenting the sweet, rich creamy insides. Mmmm. I ate it with the cherry sauce and it was grand. Ben pulled a bit of a wildcard here and chose the cheeseplate! 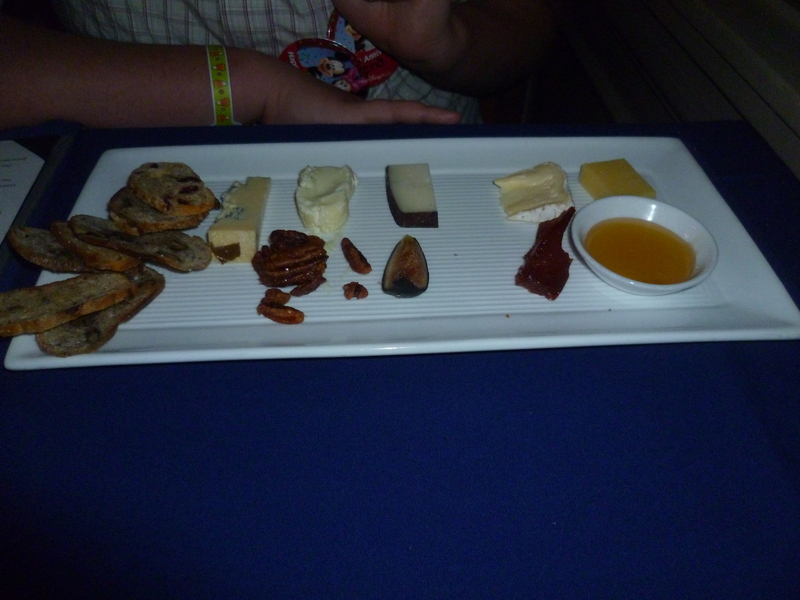 Which was really exciting as I’d wanted to see a signature cheese plate but I didn’t think I’d get to. He really enjoyed this, a bit of a treat. 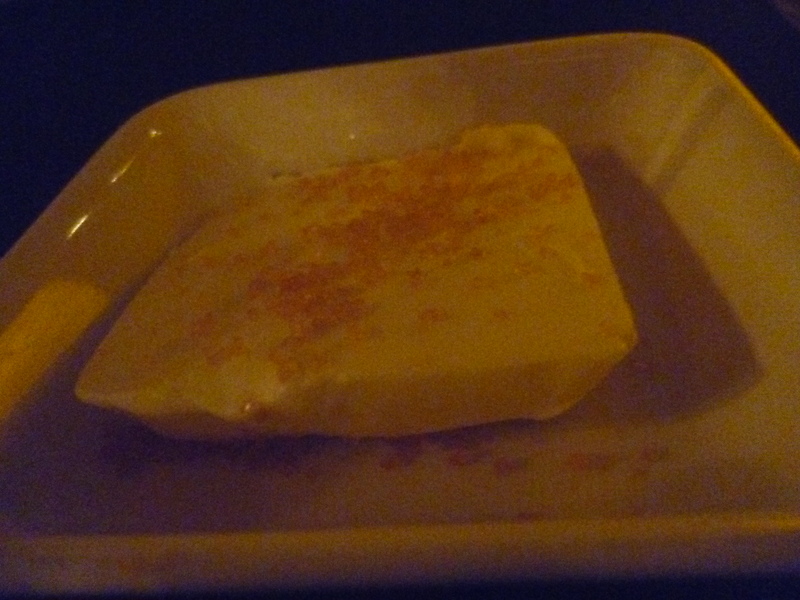 Neither of us have huge sweet tooths, I often find I need something sweet after dinner but I normally only need a couple of bites and then I’m done so it was nice to find we could order cheese as a dessert if we fancied. Artisan Cheeses – Humboldt Fog, Fourme D’Ambert, and Pleasant Ridge Reserve with accompaniements. While we were enjoying our desserts/trying not to be sick, Amir came over with a surprise!! How amazing is that. He set them down and said “Happy Anniversary, I wish you seven more years of happiness!” I’m surprised I didn’t cry! Once we’d eaten all we could of our desserts it was coming up to 9.30 and Amir came over and advised us that the Magic Kingdom fireworks would soon be starting if we wanted to watch it from the balcony. Perfect timing! It was fabulous to stand out on the balcony, champagne in hand, watching ‘HalloWishes (the Halloween version of the usual ‘Wishes.’) There were lots of other people out on the balcony but plenty of room for us all to stand and see everything. Once the show was finished we went back inside to pay for our delicious dinner. We decided to give Amir a super duper big tip because we felt he had just gone above and beyond as a server and we had really enjoyed hearing about his life and his job at Narcoosee’s and just his company in general! At one point we were even considering asking him if he’d just sit down and join us! He was really pleased and thanked us lots, he then made my night even more as I asked if we could keep the personalized menu’s and he said he could do one better than that and disapperared for a second, returning with two new personalised menu’s for us in a Narcoosee’s envelope. What a lovely, special memento of our night. 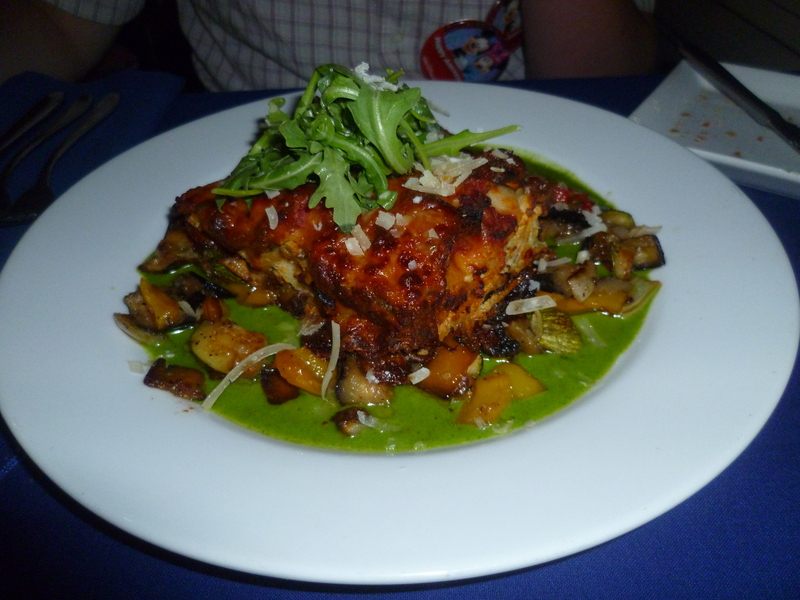 Narcoosee’s is a wonderful restaurant with delicious food and is second only to California Grill in our opinion. Obviously we didn’t get a chance to try any of the other signature restaurants (that is for our next trip!) but judging by these two, the standards will be pretty high! They’d have to be very good to beat these two though. Incredible food and one of the best meals I’ve ever eaten. Gosh I cant wait to eat here (saving up to go to WDW in 2013) Would love to have a go at Victoria & Alberts too! – Although will need to save up another £400! We are also going to WDW in 2013! When are you thinking of going? We’ve booked for October for 3 weeks, yay! I would also loooove to go to Victoria and Alberts, it’s a lot of money isn’t it 😦 We’ll have to see how funds are looking a bit nearer the time i think! 🙂 Definately try Narcoosee’s if you go, it was beyond amazing!